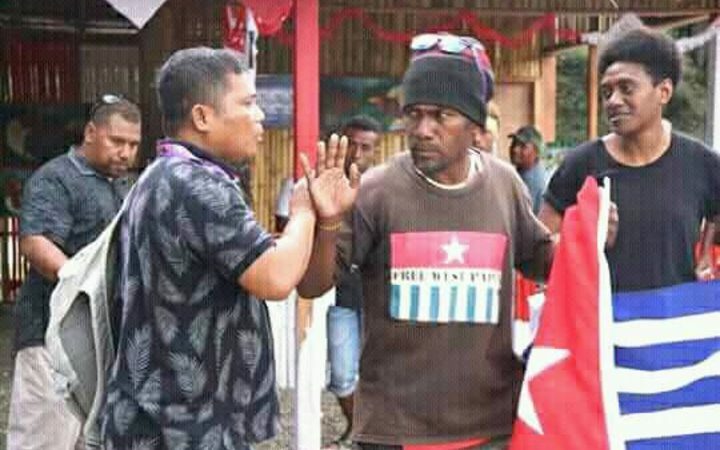 Reported from Tabloidjubi, Solomon Islands police says they confiscated a West Papuan flag at the Melanesian Arts Festival to stop any provocation aimed at the Indonesian delegation. Ben Didiomea had his flag taken by police over the weekend after he held it up in front of Indonesia’s festival stall to protest its inclusion at the event. A video on Facebook shows Mr Didiomea – who was part of a group of demonstrators – holding up West Papua’s Morning Star flag as Indonesian officials tried to move him away from the stall. He was then approached by Solomon Islands Police who confiscated the flag. Mr Didiomea said he had been standing in solidarity with fellow Melanesian people of Indonesia’s Papua region, where the Morning Star is banned. He said the Melanesian Arts Festival, which Honiara hosted over the last ten days, was not intended as an Asian festival. Police issued a statement saying the flag was removed to prevent provocation of the Indonesians, reminding the demonstrators that it was not a political event. Mr Didiomea, who along with two other demonstrators was questioned by police, said the inclusion of Indonesia at the Arts Festival was a political move by the Solomons government. According to Mr Didiomea, the police action was a sign that the country was forming a closer relationship with Indonesia. The Solomon Islands government under prime minister Rick Hou has recently shown signs that it was pursuing a different policy regarding West Papua to that of the previous prime minister Manasseh Sogavare. Mr Sogavare, who is now the deputy prime minister, campaigned internationally about West Papuan human rights issues. He was also supportive of the United Liberation Movement for West Papua, and instrumental in its admission to the Melanesian Spearhead Group in 2015. However after he was replaced by Mr Hou late last year, the Solomons government has been notably less vocal about West Papua human rights issues in international fora. A visit in April by a Solomons delegation to Indonesia’s provinces of Papua and West Papua at the invitation of Jakarta was billed as having added “balance” to the government’s view on West Papuan issues. The Solomons government told RNZ Pacific in May that it was consulting with the provinces as it formulated an official position on West Papuan human rights and self-determination issues.